From the smallest detail to the integrated whole. Corporate event or industry exhibition? Gala dinner, congress party or traditional Bavarian Evening? 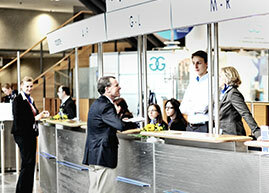 EUROKONGRESS offers individual advice and event concepts that have been tailored to your wishes and requirements. Professional congress organisation and event management is based on experience, reliable partners and on the knowledge of the strengths and weaknesses of event locations and suppliers. Organising an event is a task for specialists, who are experienced and have successfully proven their abilities in the past. Our claim: organisation must be perfect – there are no trial runs. Social Program Overall organisation of technical visits, sightseeing, city tours, receptions, galas, speakers’ dinners, evening events, congress parties, etc. Logistics RFP, contract negotiation, coordination of all suppliers (transfers, catering, artists, AV,, hostesses, security etc.